While everybody’s raving about the next potential lottery pick, every ranked team has a handful of players whose impact is vital in its success. Take a look at these players who may not all end up in the NBA but have learnt to fully embrace their role. 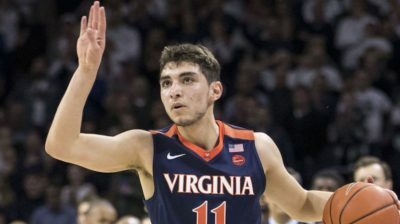 Virginia has its main shooter, Kyle Guy, and its main prospect, De’Andre Hunter, but what about the dynamo of the team? Jerome is far from passing the athletic test to be an NBA player but his IQ is off the chart. At 6-5, he can play both G spots, averaging 4.4as for 1.6to and shooting 39% from three with 5+ attempts per game. Virginia is still undefeated before playing Duke on Sunday, maybe one more opportunity for Jerome to prove what he’s worth. Like Virginia, Michigan is still undefeated. Most of the scoring comes from outside with Brazdeikis, Matthews, Poole and Simpson. Yet, somebody has to get busy with the rim protection. Here comes 7-1 C Teske. While he was playing only 12min a game last year, Teske has become the Wolverines’ main man inside as the best rebounder and shot blocker of the team (6.6rbds and 2.2bl in 27min). He has also used his improved playing time to bring more points, scoring in double figures in six games, including two doubles doubles over his last two games. He could be the key for an undefeated season as Michigan’s main competition in the Big 10 will probably be MSU and its big boys inside. It’s hard to make a name in a team with three potential top five picks. That hasn’t stopped Jack White from benefiting from this spotlight. The Australian’s athleticism/versatility to defend both forward positions (6.6rbds 1st and 1.5bl) and shooting from outside (39% on 57 attempts) have allowed him to spend more than 25min per game on the court, five times more than what he was granted last year. Who knows, the Duke label and this efficiency in a roster of stars could be the calling card for a spot in the NBA. I know, Clarke is one of the best players in Gonzaga’s roster and a potential draft pick in the next draft. Yet, he was far from being the biggest name at the beginning of the year. “Thanks” to Tillie’s injury, Clarke has been given plenty of playing time and shown why he was one of the top defenders in college basketball. Strong and incredibly athletic, Clarke is compiling 8.2rbds, 1.6st and 3.2bl, good for top 5 in college. He’s also been incredible on the other side of the court, scoring 17pts per game on a stunning 68% FG. Clarke is already 22 but his grittiness could unsurprisingly land him in that late first round. Throwback, that must be the best way to describe Alexander’s game. Contrary to Teske at Michigan, Alexander can count on Grant Williams to punish the opponent’s paint, giving him the opportunity to be the perfect garbage man, scoring 10.1pts on 68% FG to go with 7.9rbds and 1.8bl in 27min. Despite his size, Alexander can keep his man on screen’s switches, which give the Volunteers more flexibility on defense. That could help him getting his name called in June as he’s the type of player who won’t ask for the ball but gives it all to protect the paint for his team. As if Nick Ward wasn’t enough, Tillman and Goins are as scary as you can get. Tillman, a sophomore is the most dangerous, averaging 8.5pts on 67% FG, 7.7rbds and 1.7bl in 21min. Goins, a former walk on and now a senior, is the better rebounder with 9.4rbds, albeit in 27min, but struggles far more offensively with 6.6pts on 42% FG. The energy and toughness they bring on the floor will be tested against their in state rival Michigan, which still is undefeated to this day. After the duo of big men from MSU, let me introduce you the shooting duo from Virginia Tech. Racking the more minutes per game in the team, Hill is shooting 46% from three with almost six attempts per game. If you think that’s good, let’s switch to Outlaw. The strong 6-6 guard, who is grabbing 5rbds in 25min, is shooting 49% from three with 4.5 attempts per game. The Hokies will have their first big test against another shooting team, their in state and undefeated rival Virginia tomorrow, maybe the coming out party for both seniors.